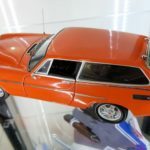 I had a quick scan through the forum and from the best of my ability I couldn’t find a review on the model car I’m wanting to show. 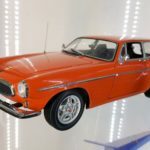 I won’t go into the history behind the Volvo P1800 ES but you can find much information about the actual car by searching the wealth of information on the Internet. 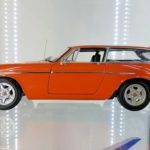 My love for this car began when I got to high school in 1989 and one of my new friends was being picked up from school by his father in one of these Volvo wagons. I was immediately drawn to the car by its unique two door coupe / wagon style body which I had never seen before. A few years down the track after they had stopped driving the car I did make an offer to purchase it from them to restore it to its former glory but they turned me down. A few years later (2002) the car was destroyed when fires ripped through the rural area they had moved to. Luckily only their storage shed was consumed by the fire and not the actual house. But sadly the car was no more. 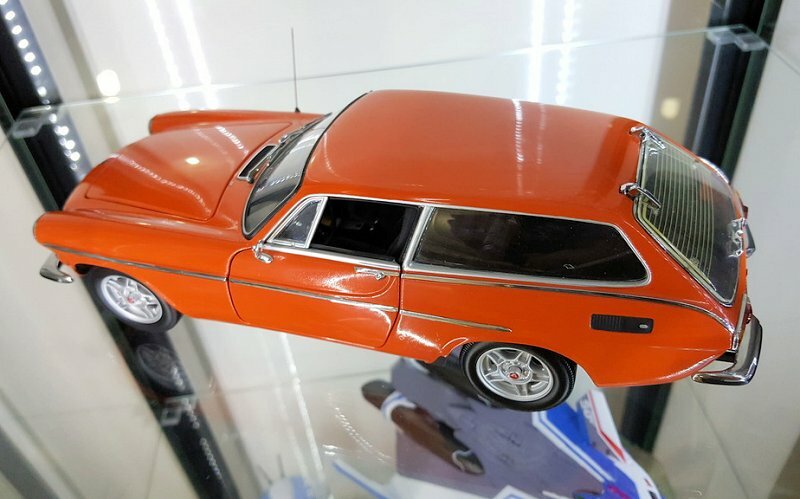 But my fondness for these cars continued and once I found out there was a 1:18 scale model of the car floating around I knew I had to have one! 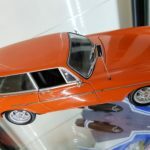 Though when I had found out they existed I had already since stopped collecting model cars and had sold off pretty much everything I had to pursue other hobbies/interests. But when I restarted collecting I went on the hunt for one and found this one on eBay. It was listed as new/unused but once I received the car I quickly realized that was simply not the case. It also arrived with minor damage from being knocked about in transit. The rear hatch shocks had popped off breaking one which was a bit painful to repair but I did manage to fix it by using a small screw from an old pair of sun glasses to secure one end of the struts to the body. The hatch lever had also broken off and been embedded into the Styrofoam part of the box! which I though was missing until I found it and dug it out! The rear bumper bar had also been partially broken off which I was able to glue back in place and one of the rear side body molding strips had also popped off which I was also able to glue back on. I did email the seller but got nowhere with him. But seeing as I was able to repair it to the point it looked 99% again I was more than happy to keep it. I’m very impressed with this Minichamps model as previous Minichamps models I’ve owned have not been so good. Even relatively late releases from them have been somewhat lackluster. 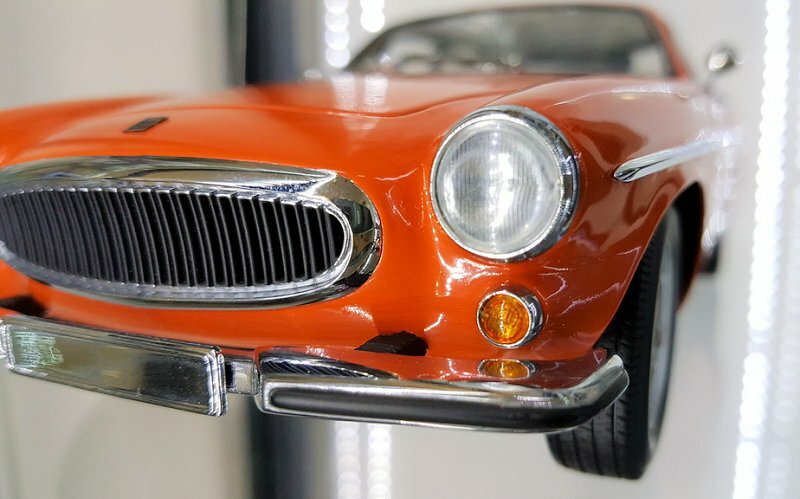 I no longer purchase Minichamps models and this Volvo is now the one and only I have of the brand in my collection. 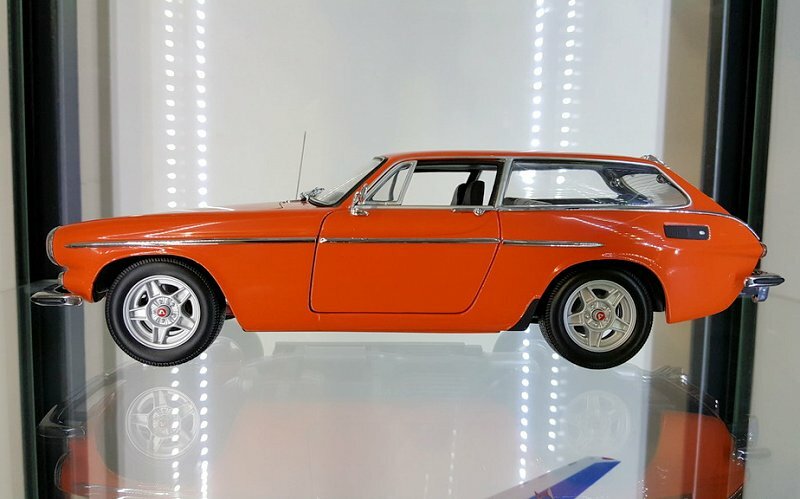 But I have to say this Volvo P1800 ES is a real charmer! Its built well with lots of nicely detailed components! 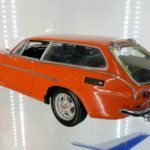 Yes its not perfect either as no model car ever is unless you spend thousands on one of those museum quality examples which are completely out of my reach. Here are some photos and highlights of this model which I will point out with each photo. Apologies for the relatively poor photo quality as I only have my Samsung phone camera to take photos with. 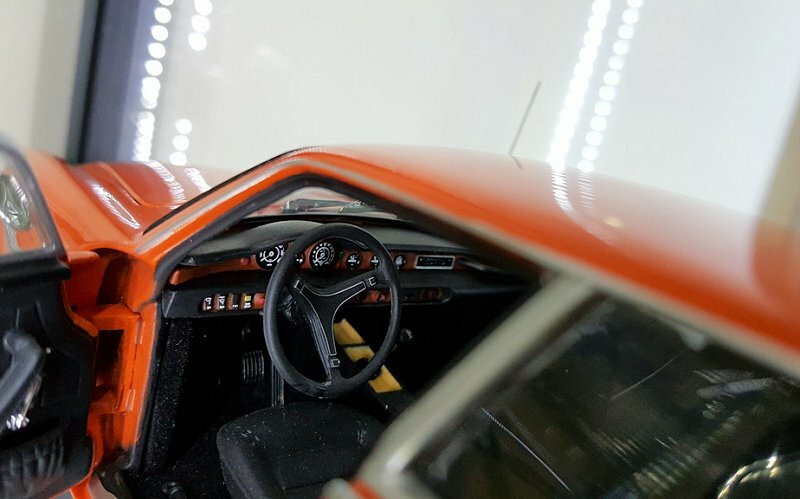 The overall shape of the car looks very accurate to the real thing. The proportions seem spot on and it has a very good shelf presence especially considering its a smaller car. 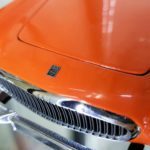 The orange paint color appears to be a pretty close match to the real thing and looks even throughout but there are a few spots which look rough which may have been caused by contamination in the factory. Its not hugely noticeable unless you look closely or under certain lighting conditions which show the imperfections in some of the photos. Shut lines are reasonably consistent throughout with no paint chipping visible anywhere. 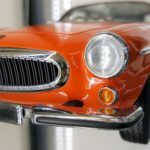 Radio antenna is fixed and not retractable but looks the parts but is easily bumped when handling the car so care must be taken not to damage it. Good thing I don’t handle my cars too often! Side body chrome moldings are nicely done but the door trim sections on both sides are slightly out of alignment with front and rear sections but its not too noticeable. 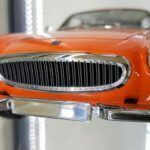 But I guess build quality of cars of this era had similar issue anyways so no points lost. Wheel & tire detail is very nice! 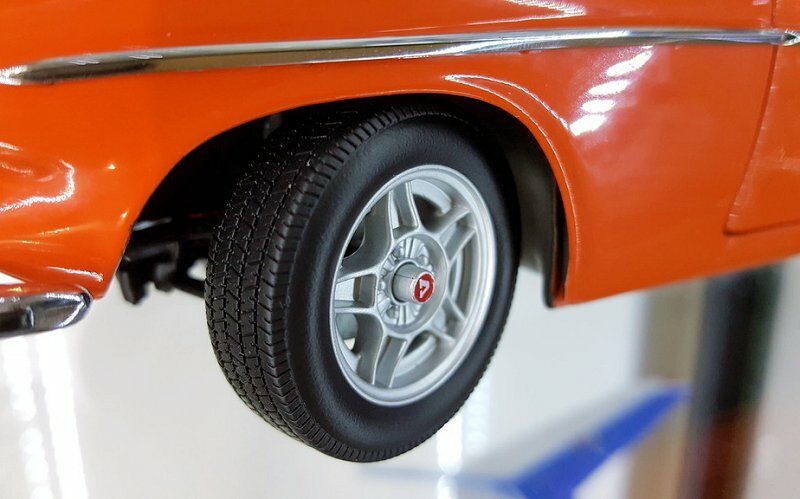 The wheels look accurately recreated to the real thing and have a nice printed Volvo “V” on the center cap. The shape of the tire and tread design are also done well and match the look of the tires of the era. Yes there aren’t any tire brand markings on the sidewalls which is a shame but its a small detail im happy to overlook. 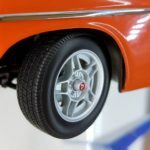 All four wheels roll equally well with a smooth wobble free rotation and don’t deflect much at all when sitting with weight of the model during display. 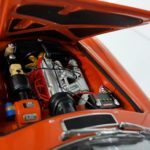 Engine bay detail is quite adequate with some nice detailing such as wiring & plug leads, battery & terminals, separate inlet and exhaust castings, fuel delivery system, radiator & fan, brake booster, fluid reservoirs & other details present. Okay it isn’t quite AUTOart levels of fine detail but comparing it to photos of the actual car its close enough! 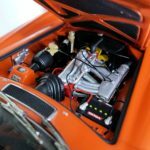 Besides many cars of that era didn’t have enormously complicated engine bays especially the more basic everyday cars like this Volvo anyways. 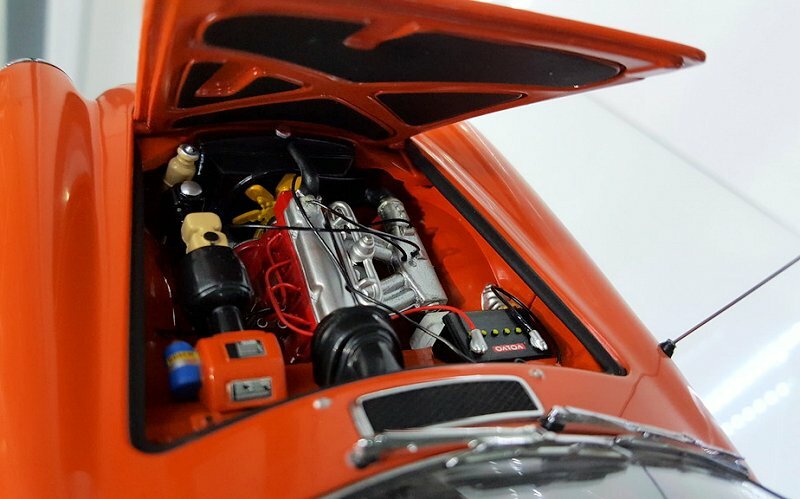 Underside of the bonnet has insulation painted on as with the rubber seal around the engine bay. 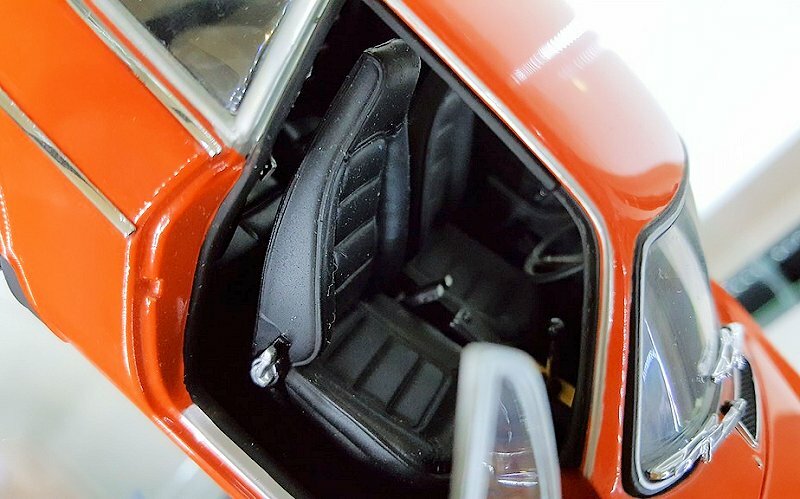 Interior detailing is very nice too and I especially like the dashboard and steering wheel details! 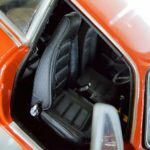 The center console and gear shifter look good and even though the seats do look rather plastic their shape is good and do the job. 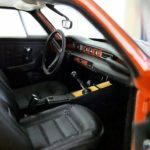 The door trims also a little plasticy but still look good with some nice detailing including window winder lever, door pockets, grab handle and latch lever. 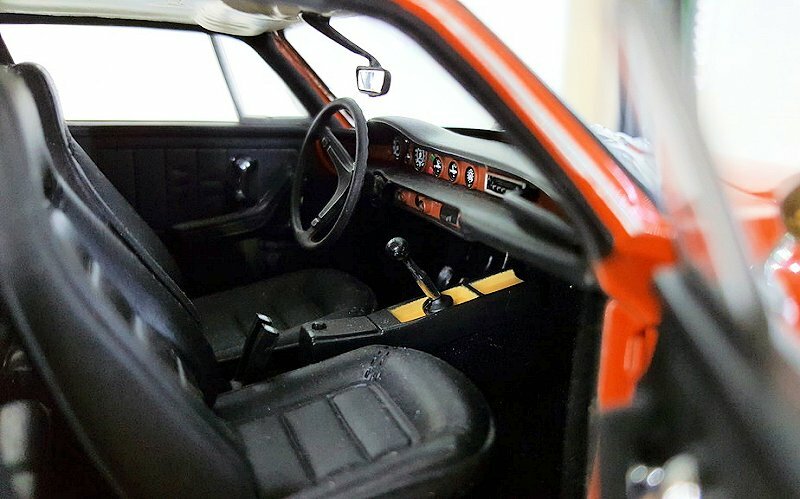 Loving the fine pin striping on the steering wheel and the dials/gauges are clearly visible and various buttons on the dash are all molded very nicely and clearly defined. 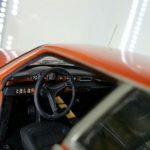 Brake, clutch and accelerator pedals are simple but more than adequate. The clutch pedal is there but hidden in the shadow out of view. 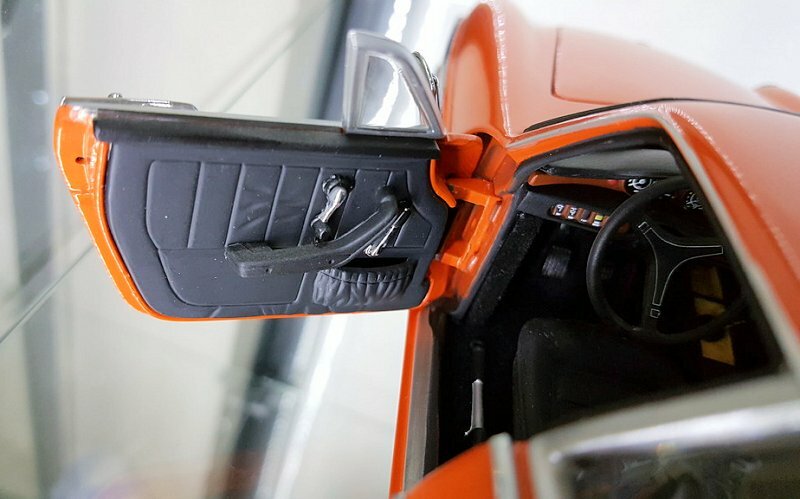 The hand/park brake lever is simple but still good and sits to the left of the drivers seat. 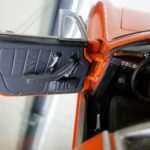 Door hinges are a bit bulky but feel solid and work perfectly fine. No complaints at all. 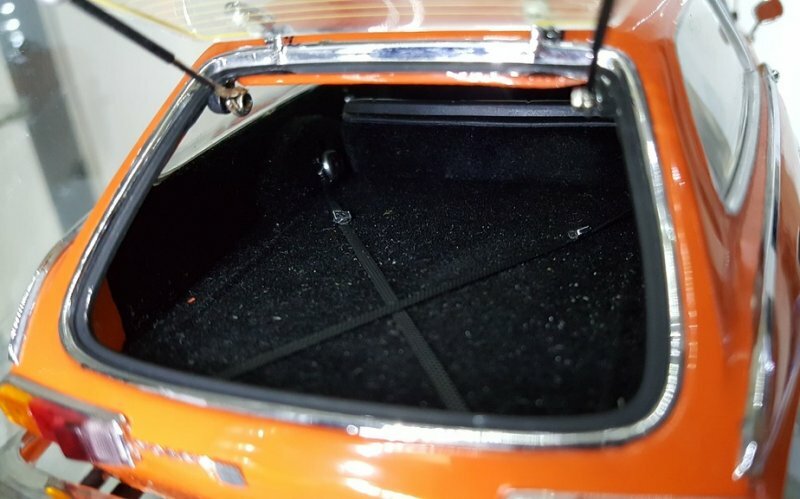 The rear cargo compartment is lined with a carpet looking material and has realistic looking cargo straps. 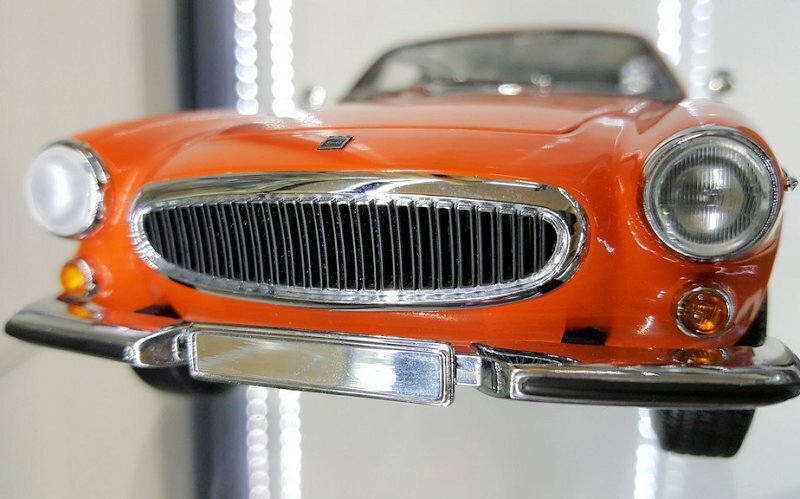 Front end detail is great with a finely detailed grille and its see through too! 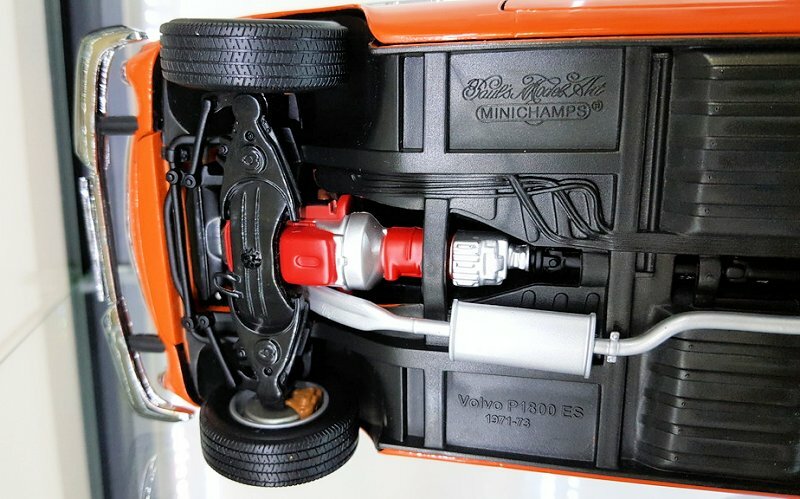 Impressive stuff there Minichamps! Head lights & blinkers are also nicely done and the chrome plated front bumper bar with black mounting points and black edge strip are also nicely done. 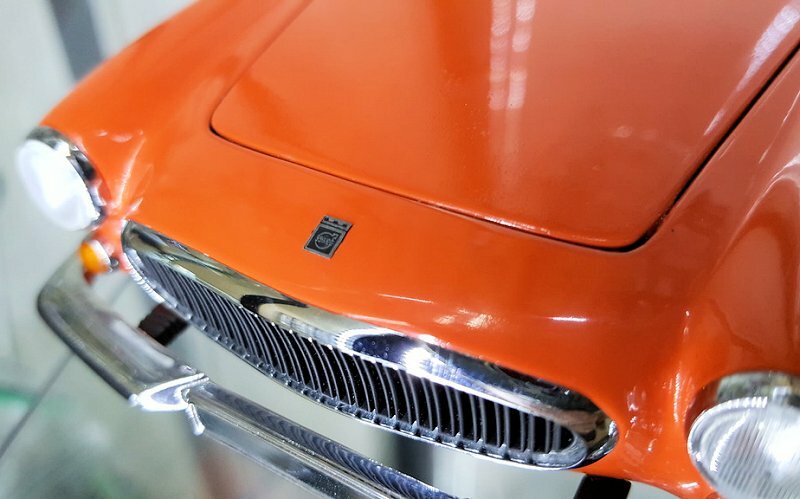 The Volvo badge on the front cowling which would appear to be a photo etched part looks really good! 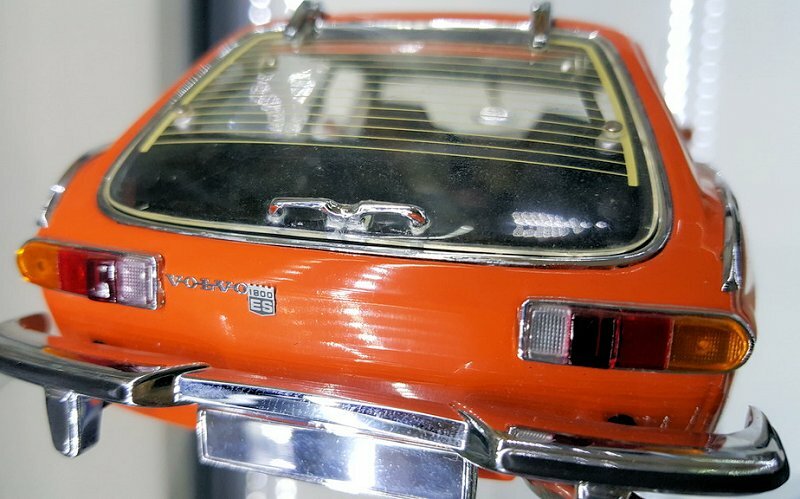 At the rear end the tail lights are nicely molded with clearly defined lighting segments surrounded in a chrome strip. Rear (all glass) tail gate is done very well with two working struts. The rear demister lines are a tad thick but still look great and I’m more than happy that they are actually there than not so again I have no complaints! The hinges are nicely detailed though feel a little flimsy, you can also just see some fine cracking in the clear plastic where the rear hatch lever was broken off during shipping. I was able to glue it back on with some good quality super glue which doesn’t cloud like other stuff does. 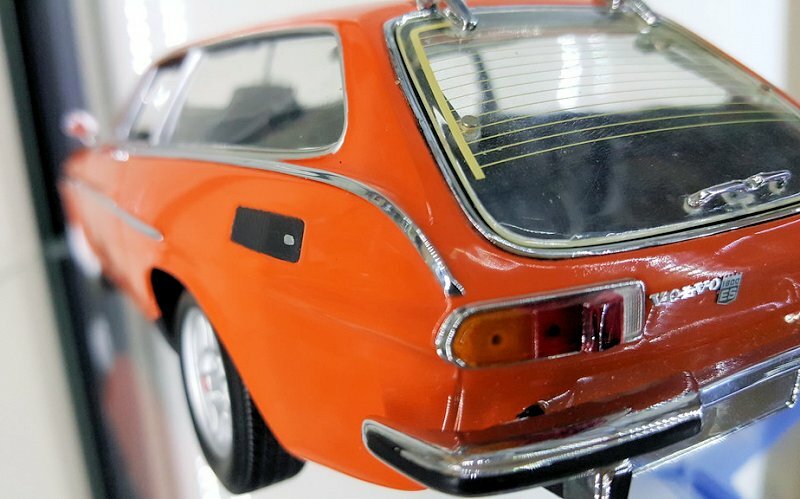 Rear bumper bar is as detailed as the front bar and the Volvo P1800 ES badge is done bloody well too! Impressive little detail! The fuel filler cap on the rear quarter panel looks okay, or at least I assume one of those black bits is the fuel filler!?!? 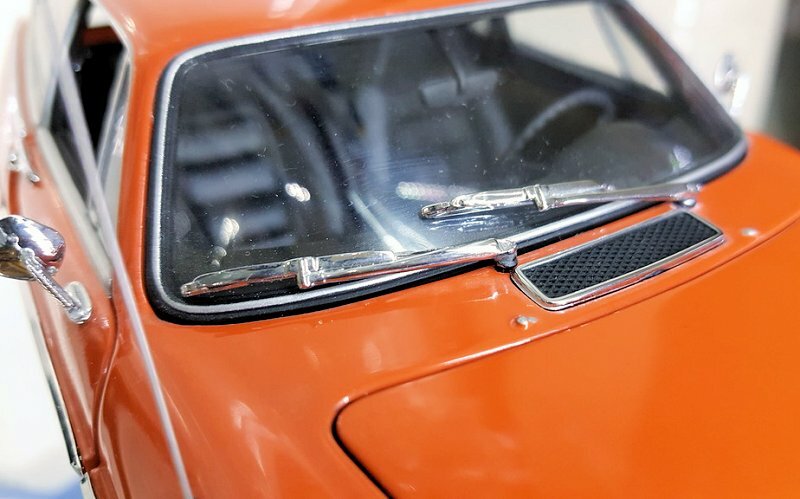 Windscreen wiper arms are molded rather basically which is a bit of a shame but they look okay and do the job. Cabin vent is nicely detailed with a nice chrome surround. Though I’d say the whole part would be chrome and the black is painted to give the desired effect. 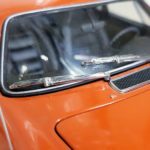 The wiper jets are physically molded and dotted with a dab of silver paint to stand out. It also looks like an extra dot of silver paint was mistakenly painted next to the right side jet.. no biggie as its not very noticeable. Side view mirrors are nothing terribly special but look good enough. Under-body detail is quite nice with working suspension front and rear with actual coil springs. 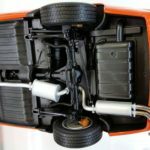 Rear suspension is a highlight of the under-body detail with a functional pan hard rod and trailing links! Tail shaft is also nicely detailed along with gearbox. 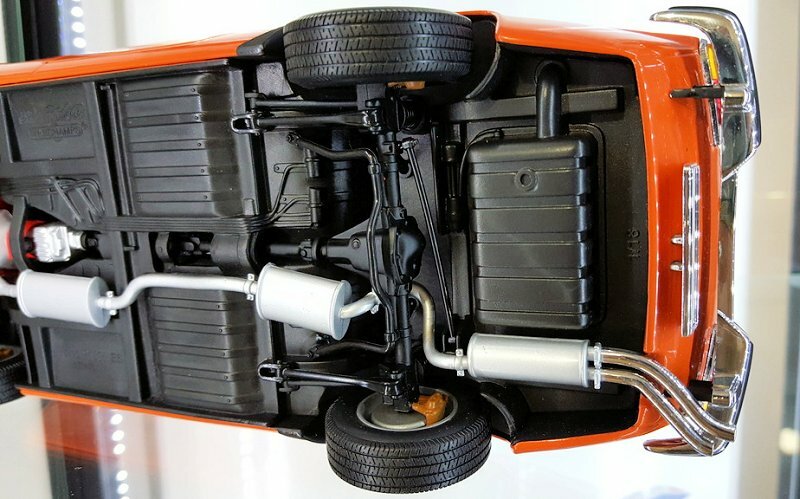 The front suspension cross member unlike the rear suspension links are not functional and molded as a single piece but still looks perfectly adequate. 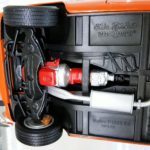 Front wheels steer about 30 to 40 degree (rough estimate) which obviously not as much as the real car but still sufficient for the model car. Brakes front and rear disks rotate with the wheels and feature pass through calipers. Brake calipers are quite simple in design but still look okay. Besides you can’t really see them through the wheel spokes from the outside so their relative lack of detail isn’t such an issue. 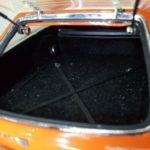 Floor pan detail is good with brake & fuel lines and fuel tank clearly visible and the exhaust system looks well done too. The tips of the exhaust are also hollowed out far enough in to give the desired effect and look good. Another thing I like is they left the spaces for the number plates free so if desired you can stick on your own number plate! 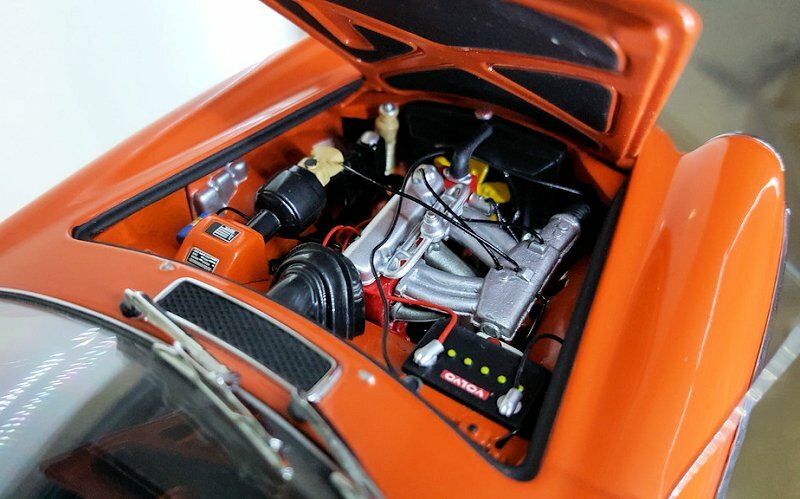 Not really sure there is anything I have missed about this car but I have to say I am very impressed by the design and build of this particular Minichamps model! Even comparing it to a much later release such as the 991 911 GT3 which I purchased for my girlfriend, this Volvo model simply kills it! I know some might not agree but once having both models side by side on display before she packed away her Porsche, to me it was a no brainer which car I’d prefer to have on display! 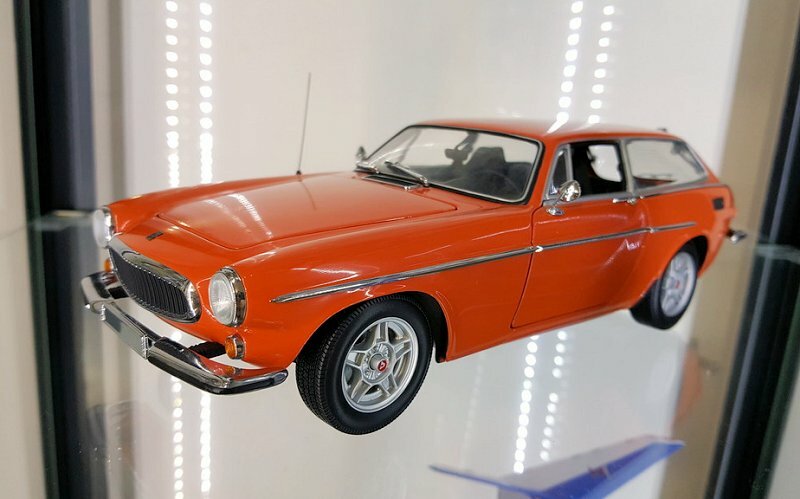 So aside the patchy paint imperfections I don’t really have any gripes with this beautiful model and I’d definitely recommend it to any Volvo model collector! Even if they are becoming expensive and hard to find. Its one of my favorites of my collection! 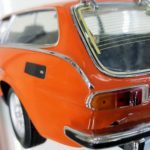 8 Responses to "REVIEW: Minichamps Volvo P1800 ES"
Indeed ! This is the decent craftsmanship for very affordable prices at that time, we are so much missing these days…..
Labour became expensive and they are all cutting costs these days unfortunately. This is a very good Minichamps model and I’m lucky I found one blue model new in a store that mostly sold trains. So I guess that was why it wasn’t already sold. Plus I even got it at a low price as he gave discount the last few days before closing (he sold the place). 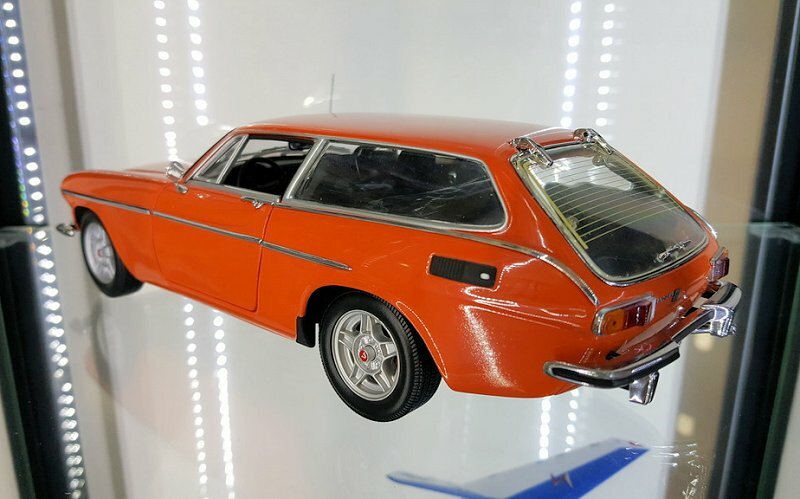 I do find it really a Minichamps again, they start with making the perfect model and end up with doing something that makes you rethink to buy or do a facepalm…. For example, license plates and side windows. Why doesn’t it have any?! Other thing, the rear lights. They should have not been mounted with the plastic pin to the rear methode. Especially within daylight and on a picture, they are really too much visable and it can be so much better if that was designed differently. 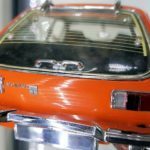 A girlfriend who is into model cars as well ? ..now tht is quite a find ! hehe! She has a handful of model cars but not many. So I wouldn’t go as far as saying she’s into model car collecting.. She once owned a 997 911 Carrera S and was considering an upgrade to a 991 so I bought her the model to spur her on but she decided against it and bought a house instead.. 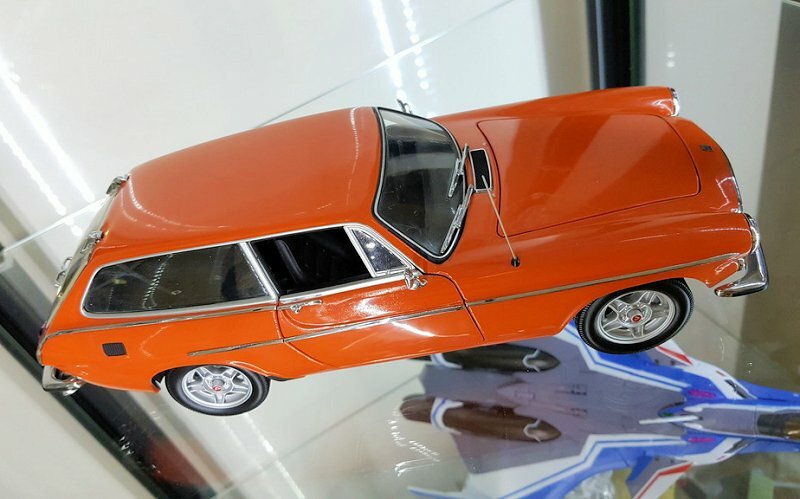 I have one in blue and while I don’t normally collect “estate” cars I just had to have it when I saw it. There was something about the shape and quality of the model that was just so right !! Well done Minichamps. Well , my comment may follow the last one,but it is in fact at least a month later….and I found my 1800 wagon !! Unbelievably it met all my needs, including being that beautiful blue that makes the car so realistic visually, I don’t remember hardly ever seeing the other colors on the car……The auction happened past 3am eastern a good omen cuz I was able to get it at less than $150.00 which from where I’m standing is a great price especially since they seem to be going for over $250 missing box and having flaws ! Seller says mine is mint and complete…….Coming from the U.K. I’m waiting, but you’ll hear when it’s in hand !! See ya……. I’ve let some time go by since I received the Volvo because as sweet as everything seemed to be going it never fails that one wrong action can as they say “screw the pooch” The seller failed to take one precaution after I begged him to never underestimate the postal services ability to over reach their record of destruction !! The seller failed to put a single piece of tape on the rear hatch……One piece ! that’s all it would have taken to prevent that hatch from flapping itself into pieces including somehow losing one sides friction strut that keeps it open when left open ( a favorite feature of mine)……..All that,…. was plenty of disappointment for me , but then this guy refused to take any responsibility or remunerate me in any way because not having a camera I could provide no pics .My rating is a 5 star 100% with a lot of verbiage to indicate my honorable practices. Without providing detail I’m sure that somewhere in the past I’ve mentioned I’m disabled , homebound, living on a real limited income, but no matter how hi the road I took this guy made me feel I was running a game for a lousy $20-5 dollars . Very frustrating !! I still choose to not mention his name……That wouldn’t help, It would just feel wrong, but the joy of ownership sure had a big pin stuck in it ! !